I had high hopes for a fast time on this course (my initial goal was a 4:10-4:15 run), but it was not to be for a variety of reasons. The quick summary: I didn’t like this race. Overall, my visit to Paris was fantastic, but the marathon was very frustrating and nothing like I had hoped it would be. I’ve run a couple large races before (Marine Corps Marathon and Chicago Marathon) and neither of them were on this level of ‘get me out of here.’ I get that sometimes you just don’t have a good run. That is the amazing thing about running; that feeling comes from time to time. It also goes, leaving you with some fantastic runs that remind you why you love the sport. April 9, 2017, was not my day. 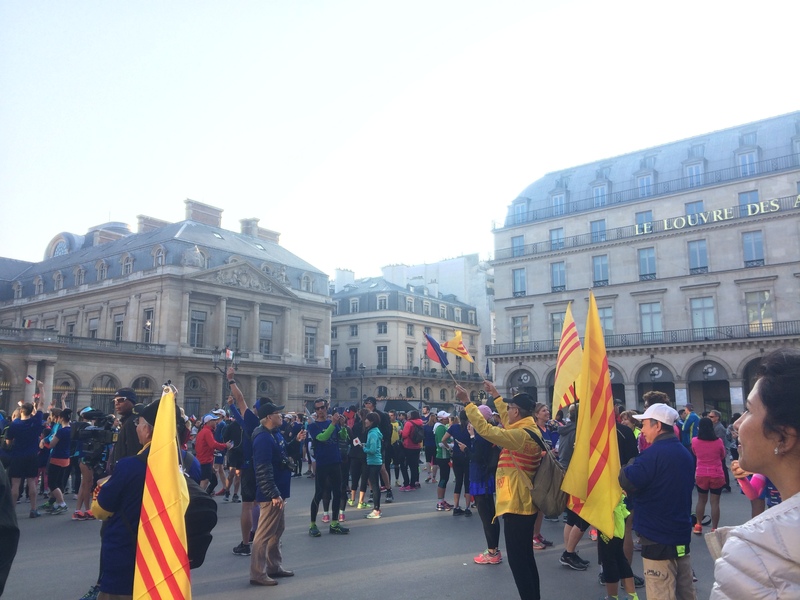 The heat and the crowds made it difficult to run 26.2 mi to start with, and the other items that resulted from these factors – along with the organization of the race – are things someone should consider when looking at Paris as a marathon destination. I arrived to Paris on the Wednesday before the race, with the plan to rest up and adjust to the time difference while also seeing the sights. My hotel was about 2.5 km from the start/finish of the marathon, in Montmartre. This was an area I had never visited on previous stops in Paris, so I was happy to expand my horizons. I ended up walking to the Basilique Sacre Coeur and looking down on Paris, as well as enjoy some great little restaurants (and crepes!) in this trendy area of the city. It was easy to get to from CDG airport (RER to the metro, changing lines ones at Gare du Nord). Ironically, I met so many others who were running the marathon and staying in this general location – but didn’t meet people staying in many other locations! Apparently this is where it is at. Most everything seemed to be a 30-ish minute metro ride, with one line change. Dubbed the ‘Salon du Running’ this was hands down the largest race expo I’ve seen. It was about a 35 min metro ride on a single line (no changing lines here!) to get to the hall, and I was very wise to go on the Thursday when crowds were probably at their lowest. I did stop to pick up my friend Mary (from New York) and her roommate Tanya (from New Zealand), and the three of us enjoyed the afternoon together. The volunteers were very helpful, and directed me to where I needed to show my medical certificate, ID and my convocation letter, all of which were needed to pick up your bib. All runners also received a lightweight backpack (which folds down). Unfortunately, this backpack wasn’t enough to stuff my purchases in. I usually don’t buy race shirts until after I finish my race (I’m a bit superstitious and don’t want to jinx myself! ), but the costs were reasonable and they had a special where if you purchased three items, you received the lowest price item for free. So I walked out with a sweatshirt (not my favourite, but I needed another long sleeve item for my trip), a bright pink long sleeve shirt and a green short sleeve shirt. I’m glad I picked these up here as there was no ‘store’ at the finish where I could purchase them. I’m sure I could do it online after the race, but then I would have international shipping to deal with. While at the expo, I ran into Tim, the Marathon Maniac I met at the Chattanooga Marathon. He was signing his dad up for the Breakfast Run. The cost was 12-euro, and you received a nice tech shirt (women’s cuts available!). I also signed up my friend Sarah, who was coming in from London on the Friday to cheer me on. She is a runner, too, but is in training for an Ironman race; her coach won’t allow her to run a marathon during her training. But she could run a 5K! I didn’t buy anything else at the expo, but I did see plenty of races that have now been added to my ‘to run’ list. I think I will be running well into my 90’s at this rate. After a long walk around the expo, my friends and I headed out to dinner. Hands down, this was my most favourite part of the running in Paris. A respectable 9am start allowed Sarah and I to get up, enjoy a coffee and a small bite to eat, then take a leisurely walk to the start near the Louvre. About 3500 people from various countries participated in the run, which was touted as a 5K (3.1 miles). We had a great time taking a nice slow pace and enjoying a beautiful, cool morning running across the Seine and past the Eiffel Tower, where we ended our run. Volunteers (who all lacked gloves) handed us croissants and pain au chocolate, coffee and water at the finish area. This fun run was a good time, and I would recommend anyone who comes to run Paris add this on for a few euros more than the marathon entry fee. We’re ready to start this thing! Sarah and I decided to stop for coffee after the run before walking back to the hotel. 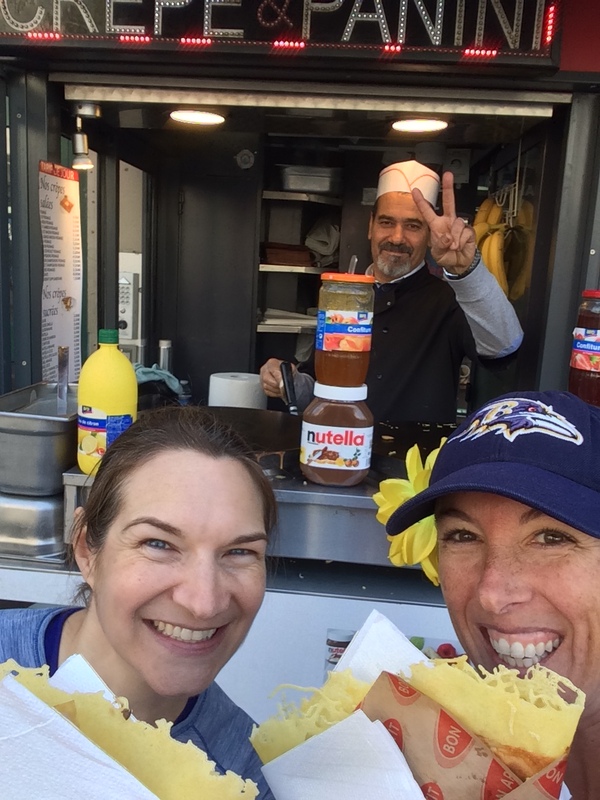 Seeing as how it was lunch time, we had to enjoy a crepe from a street stand. 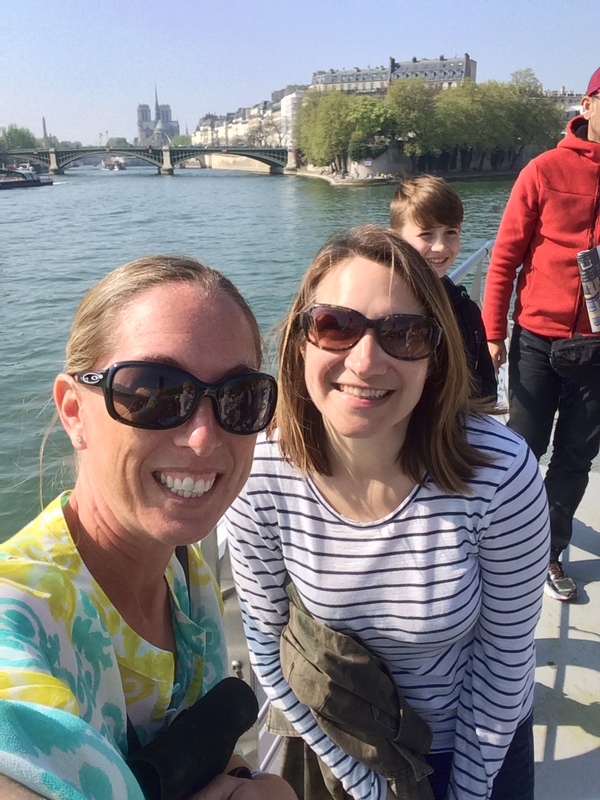 After a shower, we went back to the centre of Paris to enjoy an afternoon Bateaux Mouches cruise on the Seine, where we would see all the sights – without all the walking. It was a great time and we ended up with the cheesy photos they took as we boarded. This race had a late start. I decided to walk the 2.5 km to the start line as a way to work out the nerves. With all the walking I did while in Paris (averaging more than 10 miles a day), I’m not sure this was my smartest move, but it helped me to feel comfortable pre-race. We met up with friends Mary and Tanya at their hotel, which was a stone’s throw from the Arc de Triomphe, before walking the final stretch to the start. I took my photo with SSG Jimmy Foster, my 22 Too Many hero that was helping me take on Paris, near the start area. This photo at my races has become very special to me. I love having these pictures to share with the family and to post on my social media. I do talk to my heroes during my races, and this is one of those moments. When I know the camera is on them. Never would I have thought that I would curse a sunny spring day in Paris. But there I was. All week, I watched the forecasted temperatures for race day move up and up and up. In the end, much of the race was run in 79-degrees in the shade (I saw one report that said it was about 91 in the full sun). I was in the 4:15-4:30 corral, which was scheduled to leave at 9:40am. This meant I was going to be running my whole race in the warm temperatures. After hearing many stories of slow runners who ‘lied’ about their finish time (their word, not mine) in order to start earlier, I knew that it would be a bit of a mess as I came on those folks at some point in the race. As it was, I was ‘nervous’ about running through lunchtime, which was a new challenge for me. But I tried to eat my breakfast a bit later than normal and just decided to eat more at the aid stations along the way to ensure I never got hungry during the race. Mary and I said ‘see you later’ to Tanya, who was in a later corral than we were, and we tried to walk forward to find the entrance to our corral. We couldn’t find it. Someone then told us we overshot it. We walked back to see lots of runners crowding a small entrance and we headed towards it. In the corral, they had port-a-loos and an open urinal (for the guys); a man in front of me very enthusiastically sprayed something (anti-chaffing spray I hope!) down his shorts, both back and front. I got rather an eye full without needing that right before the race. We followed the crowds and quickly realized that we were in the earlier corral, which was about the leave. I was ok with that, knowing I would get a half-hour head start on where I thought I would be taking off, meaning I would have slightly cooler temps for a short while. Without ceremony, we were at the start line and I took off. Pre-race selfie – in the wrong corral! The first mile was probably my favourite. 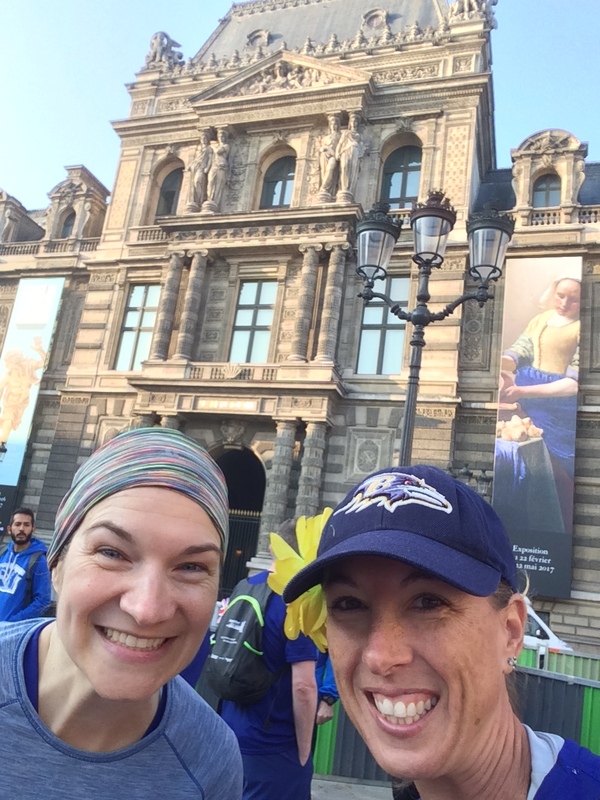 The energy of starting a marathon, traversing the cobblestones as we went past the Louvre and various landmarks in Paris, the joy of being out there and knowing its just you and the road. Well, and about 43,999 of your newest friends. Quickly the course narrowed and we headed east towards the Bois Vincennes. Sarah was planning to be around the 5K mark, just past half way, then around the 42K sign. I was running strong the first few miles of the race, which were partially shaded. However, when I was in the sun, it was obvious that my running would suffer a hit at some point. Water stops were about every 5K, which is typical in Europe. However, on a hot day like race day was, this was not enough. To top it off, the aid station was only on one side of the course. With a packed race, people started cutting over without any consideration for other runners. (This was a common theme – lack of consideration and downright rudeness as the race went on.) If they had the aid station set up on both sides of the course, this would have eliminated quite a few issues. So I almost got plowed into on multiple occasions at this first stop. People also stopped right as they picked up their water. At every water stop, they had bottles of water (which I used to fill up my larger bottle), bananas, oranges, sugar cubes and dried fruit. There are so many things right and so many things wrong with these stations. First, there were no electrolytes except for one stop about 2/3 of the way through the race. The bottles made for a lot of trash, and even though the water sponsor provided many, many recycle bins for the bottles, most runners I would say ignored them, throwing their trash on the ground instead. Many runners would also take their water bottle and stop in the middle of the course, pouring their water over their heads. This not only made it an obstacle course to deal with as I ran around these people, but the ground quickly became very wet and slippery, especially on the cobblestone areas. Water table at an aid station. Notice all the sludge, peels and trash. Gross! When it came to food, I noticed that the volunteers weren’t wearing gloves when they handled the food. And runners were sticking their sweaty (and other) hands into the large trays of dried fruits and pretzels. Not very appetizing at all. I tried not to think about it. As always, I love European races for the fact that they only give out gels at one or two stops (Paris was no exception), focusing instead of real food. The problem here was that people were discarding their banana peels and orange rinds on the ground, rather than toss them in the compost bin. The sheer number of peels, combined with all the water that people were dumping on themselves (and the ground) meant that every single water stop was a sipping hazard. I slipped at one, almost going down and actually twisting my knee a little bit. It was uncomfortable running the next mile because my knee hurt from that. I heard of people who did go down. Aside from the chance of getting seriously hurt because of slipping on this mess, it was absolutely disgusting. They really need to do something about this issue. It’s very dangerous for the runners. There was great entertainment along the length of the course for the runners, with many drumming groups beating out a rhythm for runners to enjoy. There were a lot of spectators, but oddly enough, they were really quiet overall. They would typically cheer for people they knew, but not really for the other runners. I’ve never experiences such a quiet race before – especially one of that magnitude! This was especially a shock when we headed to the 42K mark and the sidelines were packed with (quiet) spectators. Also, I noticed there weren’t cowbells being rung by spectators! At US races, there are always so many cowbells. After running through the very spectator-quiet park in the east, we turned back toward the city centre and the half way mark. By this point, I had been jostled by other runners, been cut off many times and was feeling the heat. I was in a bit of a mood, when right around the half way, someone pushed me from behind and I face planted into another runner’s sweaty back. Thankfully, I bounced off the runner and stayed upright. But I was pissed. This unfortunately, was not uncommon in this race. They were some of the rudest runners I have ever seen. Race etiquette was lacking. When I crossed the halfway point, I was a couple minutes behind where I wanted to be to reach my initial time goal, and I knew I was going to be slowing down with it getting warmer in the second half of the race. So at that point, in my foul mood with sweat dripping out of every pore, I saw Sarah in the crowds. I said a quick hi and put my head down. I know if I stopped to take a picture or talk to her, I would not likely be continuing on. Never have I been that close to quitting a race; the temptation was indeed there. That was how miserable I felt. Yet I made a promise to the family of SSG Jimmy Foster. 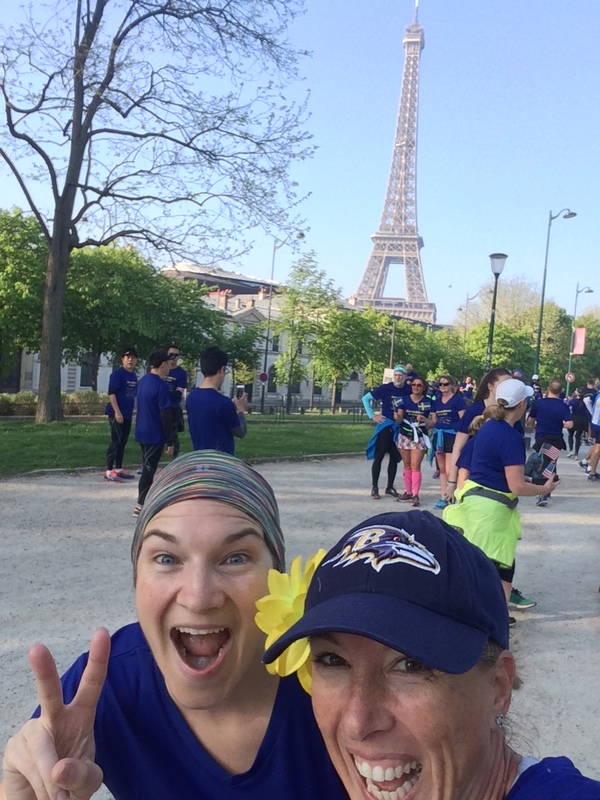 And with my yellow flower on my hat, I decided to try and make the best of a bad run, remembering I was running that race in PARIS, running because I CAN. It was shortly thereafter that I saw someone getting carted off the course on a stretcher on an ambulance. This was not the only person; I saw many people along the rest of the course succumbing to the heat (I didn’t see any visible injuries, so I’m assuming it was the heat) and needing medical help. I saw three people being put into ambulances. I saw zero ice packs being used by medical teams, which was surprising in the heat. I even saw one person being rolled onto their side with their head hanging over the curb; their face was a gray colour that was not healthy. The medical attendant was merely fanning a piece of paper over them (what????). Seeing the first person go down made me think that with my initial goal out off the table, I needed to run a smart race and finish without issue. New goal initiated. We ran along the bank of the Seine, through a very long tunnel with flashing green lights in it (and blissfully shady! ), which was the tunnel where Princess Diana died (I didn’t know this until after I finished the race). Upon emerging, we saw the Eiffel Tower, and as part of my plan to slow it down and try to enjoy, I walked for about 3/4 mi on the stretch (about mile 18). It was scenic, and if I was going to enjoy the view anywhere, it was going to be here. Why not prolong it? Eventually, another runner came up behind me and tapped my shoulder saying ‘allez allez’, to which I smiled and decided my ‘break’ was over and I indeed started to run again, making my way to another park, the Bois de Boulogne. The parks were nice, but as a few of us discussed after the race, those parks could have been anywhere in the world. I wanted to see Paris! So it was a little disappointing that we had so much running in the parks. A natural photo location would be with the Eiffel Tower in the background, right? I remember there being photographers somewhere around this area, but they were not facing the direction where they would have any landmark as part of the photo. Sure enough, when I saw my race photos, it was just a crowd of people; nothing said that they were taken in Paris. Very disappointing and a miss by the race organisers, in my opinion. Another point of contention that was making me very frustrated by this point was the lack of crowd control along some of course. Crowds were squeezing into the course (even though they had plenty of room), making the course very dangerous. I prefer to run on the far right of the course as a general rule, and there were several times where I was squeezed so much that I brushed – and even bumped into – spectators. There simply wasn’t anywhere to go on the course to avoid hitting someone. In my extreme annoyance at having run into a spectator, the mile 20 marker appeared like an oasis in the desert; I moved to the left side of the course to take my photo and give my thoughts on how I was feeling. No party at Mile 20 that day! I was ready for the race to be over! We entered the woods, and I observed more people slowing down, walking and stopping for medical assistance. I did a quick check on myself, decided I was OK and pushed on. I knew that if I could keep up my pace a little, I was only going to be running another 60 minutes or so. The end was in sight (so to speak). With about five kilometers left, another Marathon Maniac that I met at the Breakfast Run came up beside me; she was having a great run and was on pace for a PR. In my unhappy mood, I wished her well and encouraged her. There was no way I could maintain her pace. I kept thinking about her the rest of course and wondered if it was just me who was a grouch about things (spoiler: it wasn’t just me. Most of the other people I spoke with had the exact same issues with the race as I did). Final stretch to the finish line! Countdown on, I was just eager to be out of the woods – literally! Once we emerged from the woods, we basically saw the 42K sign, and the streets were lined with all the spectators cheering (quietly) people in. In Chicago, the sound would have been deafening. In Paris. It was like being at a Little League baseball game. Oh well. Sarah was meant to be in this area, so I started looking for her as I ran through the final stretch. Not seeing her, I took out my phone and did my almost-finished video message to the family of SSG Jimmy Foster, took a photo and tried to get my legs to make a final sprint to the end. I remembered to turn off my watch this race. I usually forget. I clocked 26.53 miles total (most of the extra steps were from the first 5K) in 4:35:32. After crossing the finish line and trying to walk around the many people who simply stopped walking, and those who legitimately needed medical assistance at that point, I picked up my finisher shirt and plastic poncho (it was very warm, yet I did see some people wearing them; I hope they were not suffering from heat stroke! ), then received my medal. The food was sadly lacking and there wasn’t my favourite – beer. Just another bottle of water, half a banana and some sugar cubes to eat while you looked for your friends/family. A shot from the 30K mark; the field never thinned out. I got through the end gate and looked for Sarah, finally deciding to message her where to find me. In the meantime. I was getting worried that I might crash, so when I saw a beer tent selling beer, I bought a Heineken for 7 euros and sat down on a curb. When Sarah found me, I asked her to buy me some French fries (didn’t see them earlier when I got my beer) as there was no way I was ready to stand up again. So we sat there enjoying salty fries and cold beer while we continued to bake in the full sun. All around me people (runners) were in various states of undress (this was Europe, after all). Nothing surprised me at this point. Sarah did tell me that she left the 42K sign probably a minute or two before I came through. She was trying to track me, but apparently the app didn’t work; in fact, it didn’t even show that I had started (for her at least). I unfortunately had many friends back in the US and Cayman tell me the same thing. How disappointing, especially for my husband who woke up at 4am and 6am to see how I was doing. Eventually, the beer was gone and we decided to head back to Mary’s hotel to wait for her. First, it was out of the sun. Second, it would have been like finding a needle in a haystack to actually locate her around the finish line. She arrived looking like she was ready to crash. So we headed out for a drink. Because we definitely earned it. In comparing experiences, we had the same issues, stating if this was our first marathon, there likely wouldn’t be a second one. She told us about meeting a few runners, including one who passed out on the course from the heat. No one helped her. NO ONE. And at any given point at this race, there were many, many other runners around. She apparently was in tears when Mary came upon her; they finished together. That story was like the icing on the cake of this experience. And I’m guessing there were other similar stories out there, unfortunately. With all of us needing a shower (we had all sweated a lot that day! ), I wisely said I wanted to take the metro back to the hotel, a turn of events for the usually overly ambitious walker that I am. It was a good decision. You are in Paris, and probably are taking a few days to enjoy the sights – it’s a great city to visit! I know this seems to be a very negative recap, but in all honesty, I didn’t enjoy this race much at all. I think that if it was a cooler day, the other things wouldn’t have bothered me as much as they did, or if it wasn’t as crowded. I guess one thing that I have learned from this is that I simply don’t enjoy the larger races very much – the crowded course altered my mood very quickly and made for a challenging experience mentally. Perhaps I’ll stick to smaller events, but then I remember that I’m already signed up for Berlin. So let’s see how that goes. Maybe I’ll find redemption in another large race and this was a one off experience. But as it stands, this is not a race I will run again. Instead, I’ll continue to enjoy fabulous French wine – sans running! It’s taken me a little while to catch up and have been looking forward to your recap! Sounds like a very tough race. 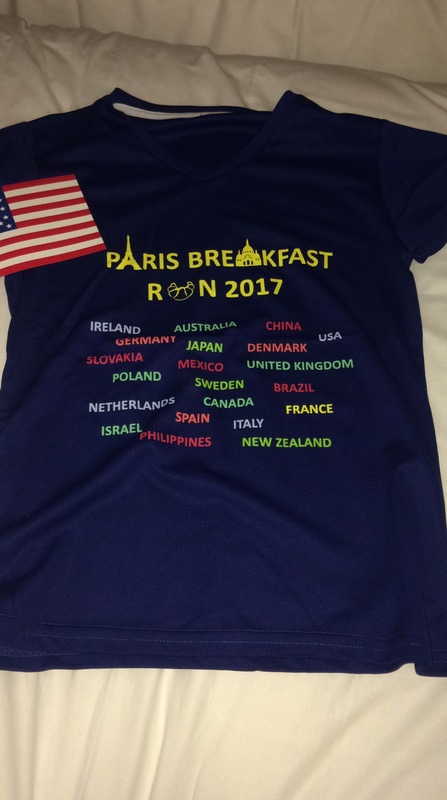 From what you described, I pretty much would have hated this too and we have actually considered Paris as a Euro marathon one day. Not so sure I would keep it on the list…maybe look at Berlin. I would love to do London but won’t happen unless I’m willing to write a huge check to charity. The weather certainly didn’t help but great job in finishing and at least finding some positives. To your point…you are in Paris. Think we’ll stick to the sights, food, and wine should we ever make it there. Now, I need to go check your race calendar to see what you have up next! Cheers Robyn! Yeah, I wont be recommending Paris to anyone, but others enjoyed it, so I guess it boils down to what you are keen on doing. I’m signed up for Brighton (in the UK) next April 15th, which is less than 10,000. I also am still a huge fan of Dusseldorf in Germany (2000-3000 marathoners). I’ll let you know about Berlin as I’m running it in September. It’ll be another crowded race course, but I’m imagining the organization will be a bit more on point (they are German after all!). There are just so many out there! And my next one is Ogden, Utah, on May 20th. Net elevation loss of about 1100 ft, so it will be a totally different course than I’ve ever done. Choosing a race can be a challenge; big races sound fun, but if you aren’t a crowd person, you probably won’t enjoy them. If you need energy and others around then small races won’t be your favourites. It’s definitely good to think about personal likes/dislikes, but it is also valuable to stretch yourself and try something that takes you out of your ‘comfort zone’ every now and then. Is MCM your next one? Be prepared for a crowded course, especially in the first few miles. I didn’t feel like it opened up much until about mile 10. But I loved running through the parks in the early miles. It was a good mix of things I enjoy/don’t enjoy about races. Hope you will find it an experience to your liking!